In Israel, the notorious killer El Aqrab has been arrested. The Islamic Jihadist is famous for wrapping his victims up with incendiary devices designed to produce flames in the shape of Koranic verses. Some call it aesthetic destruction, the work of an artist. His long-awaited arrest is cause for celebration. In Kazakhstan, 8 kilos of Highly Enriched Uranium is stolen and an ultimatum is issued to the West: Release El Aqrab or a nuclear bomb will be detonated. Plans are put into action but, at the last moment, El Aqrab escapes . . . and the authorities never get the bomb. In New York, Homeland Security is convinced the bomb is headed their way. After decoding a secret message hidden in an Arabesque design within the e-wallpaper of a Jihadist suspect’s PC, only FBI Cryptanalyst Forensic Examiner (code breaker) John Decker thinks differently. Aided by brilliant and beautiful oceanographer Emily Swenson, Decker believes the bomb’s true destination is La Palma, in the remote Canary Island chain. Now, Decker and Swenson have less than six hours to prove their theory, defuse the bomb, and prevent a 17-story mega-tsunami from annihilating the Eastern Seaboard. 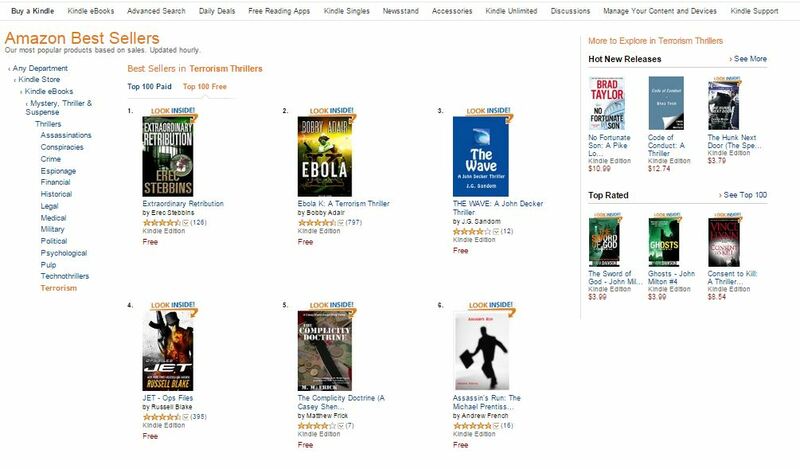 The Wave made it to #3 on the Amazon Thrillers bestsellers list. To purchase your copy of The Wave @ Amazon, click here. This entry was posted in Uncategorized and tagged Deep Impact, Homeland, J.G. Sandom, John Decker, Mega-Tsunami, The Wave, Thriller, Tsunami, Wave. Bookmark the permalink.